My sister lives in London, England near an Arab area. She has seen fabrics there and wanted to send me some, but requested some guidelines from me so that she could choose something appropriate. But I realized that while I had absolutely no trouble in identifying East Indian fabrics, I would not be able to recognize a fabric from the Middle East. It was time to hit the books. Here is the result of that research, as well as some of my own ideas. Stripes appear in pictures over and over again. Often the stripes are dark against a light background, and are colored red or blue. I noticed also that the sleeves were usually cut on the crosswise grain; by doing this, the pattern of the stripes is not broken at the sleeve seam. I wanted to make an Egyptian-style caftan, and found some fabric which instinctively seemed appropriate. It was linen-like, with medium-blue stripes bordered by narrow white, on a navy background. A couple of weeks later, I attended my embroiderers' guild meeting. Imagine my surprise when the speaker showed us a piece of fabric from North Africa almost identical to what I'd chosen! There is a type of striped satin made in Syria and used in Palestinian costume; it is alled "atlas" and is usually red and yellow. A note on color: green is popular throughout the Islamic world because it was Mohammed's favorite color. Have you noticed how many flags from this area include green? Palestinian cross-stitch embroidery is usually red on black fabric, with blue or yellow accents. Sometimes it is dark red on cream, and the accents can be blue, green, orange, or bright pink. The designs are geometric and regular. Common motifs include moons, kohl pots, palm fronds, hijabs (triangles - head scarves), and cypress trees. Kaffeeyah is the checkered head scarf worn by Arab males. Most common is red or black on white, but here in Toronto I've found some interesting color variations: sandy brown, two shades of green, golden yello on black, and even neon pink on white! My own kaffeeyah is red on black, because it reminds me of Palestinian embroidery. Tulle bi telli fabric (which many dancers call assuit), from Egypt, is made by bending bits of a narrow silver-colored metal strip around the threads of a mesh fabric to create designs. These designs are regular and stylized; in fact, they are similar to those found in Palestinian embroidery. The fabric is usually black, but occasionally it is white. There is a thread similar to that used for the designs, used in metal thread embroidery — it's called "plate". 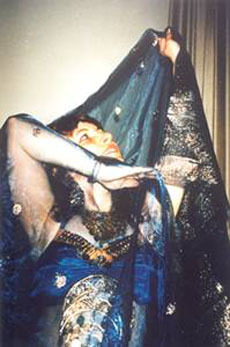 In the photo to the right, Shira is wearing a dress made of black tulle bi telli fabric over the top of a turquoise unitard. Fabrics inspired by the Islamic world could be included in this discussion. Admittedly, this is more of an idea rather than something tangible that can actually be found - but, nevertheless, I have found two examples in the Toronto area. The first is printed with a tile design from a mosque; I found this in a fabric store on Derry Road, at Airport Road, in Malton's Little India. The store has since closed. The second is pale blue damask polyester, with a tone-on-tone striped design of the star and crescent of Islam. I found this at Maharani, at 1417 Gerrard Street East. Alas, both pieces were end-of-bolt. On a trip to Damascus, I saw intricately woven silk using many colors, woven into complicated Arabesque designs. Many years later, I still regret not buying any. Designs borrowing from the Ottoman Turkish Empire also qualify. Interesting plant designs are common, with tulips and carnations. Some of the Islamic fashion stores in Toronto carry scarves from Turkey; some of these feature such designs. We could also include fabric with designs inspired by Pharaonic Egypt - although such designs have a somewhat different flavor. These are all of the authentic Middle Eastern fabric types that I've been able to think of so far. If anyone has any other ideas, I'd love to hear from you. Please write to me c/o Shira, and she'll forward your message along to me.